What a fantastic read! Joe gives readers a window into the richness of the local culture. Hurley entertains and educates us with the wit and in-sight that made him a popular, respected newspaperman in Connecticut for more than three decades. Welcome fellow travelers. We are about to trek ten million steps (3,600 miles) across mountains, plains and deserts—during summer’s heat and winter’s snow. Now here’s the scary part: I’ll be your guide, and I’m new at the job. So expect a few bumps along the way, but we’ll share a great adventure as we explore our nation the old-fashioned way—by foot. So begins this limited edition 240 page book chronicalling Joe Hurley’s coast-to-coast walk along Route 6 from March through December 2004. Beautifully illustrated with more than 280 photographs by Travis Lindhorst, this quality paperback book is priced at $32.00 (plus tax). Check your local bookstore or purchase online at www.route6walk.com. To arrange speaking engagements, book signings or interviews, or to purchase signed books, contact Joe Hurley directly at 860-354-1389. 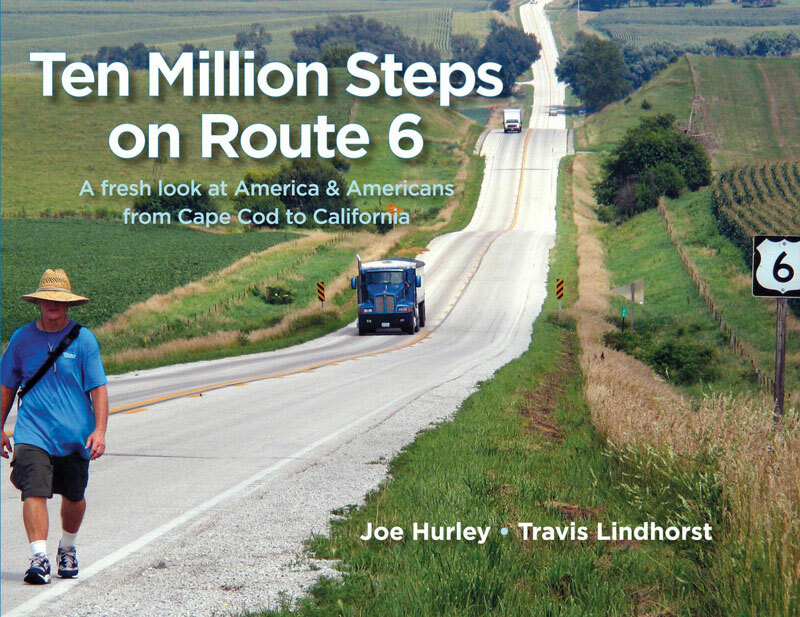 Ten Million Steps On Route 6: A fresh look at America & Americans from Cape Cod to California by Joe Hurley with photographs by Travis Lindhorst. ISBN 978-0-9816781-6-0 published by Arkett Publishing, a division of Arkettype, PO Box 36, Gaylordsville, CT 06755, 860-350-4007, www.arkett.com • www.local-author.com • www.route6walk.com.